Welcome to the SynchronizerZ Portal! Join us and belong to the most active and fastest growing organisation in the Star Citizen universe. 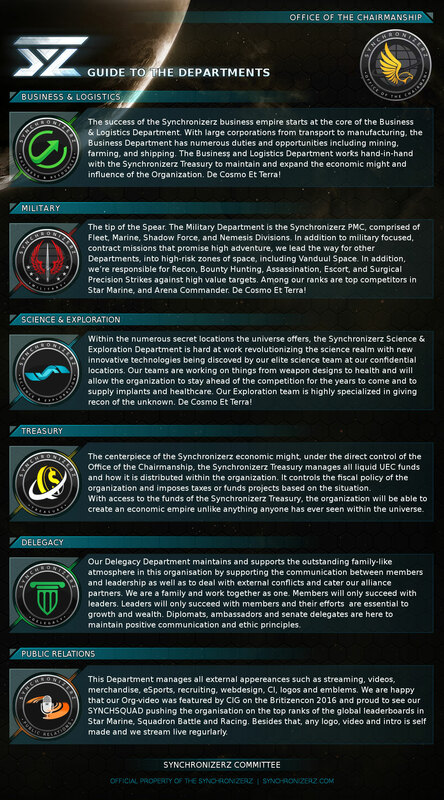 Become a Synchronizer and be a part of our familly encompassing all aspects of the game! We have some of the highest ranked players in Arena Commander and Star Marine, perhaps you can earn your place on the leaderboards and with a fleet of ships the envy of larger organisations there are sure to be opportunities for all to experience every aspect of the game as a valued team member. You will initially be placed in the Orientation Department until you have had time to decide which of the other Dept's you want as your primary. Participating in our Discord channels should help you choose.